Yesterday as I drove the girls home from school, they started in asking if they could play on the computer. Ugh! Can I tell you how much I hate that these days? Such a fight with them. But perhaps that's another post for another day. I told them "No..." And they immediately started throwing fits. Then I continued, "We're not going to play on the computer today. We are going to do a craft!" To which they responded with cheers & squeals. There was no containing their excitement. I couldn't get the supplies out quick enough when we got home. Well, today I am so, so very excited to share an amazing book with you. Teach Yourself VISUALLY Crafting with Kids by the super talented Jennifer Casa. I have such an admiration for Jennifer. After connecting through our blogs, we decided to meet up a few years back when we were living in Ohio. We quickly became zoo buddies & had to meet up with our kids there every few months. I was always very impressed with how in tune she was with her children & how they obviously were the most important thing to her. Of course we would always talk about blogging & etsy & pushing ourselves creatively. But I could tell that her role as a mother & her relationship with her kids was right at her core. She is the perfect creative mama to write this book! I have been waiting so long to see the book that she's been working on for the past year & it was so exciting when it arrived in our mailbox. The book is fabulous!! There are 75 projects with great step-by-step instructions & photos. The projects are clever & creative & perfectly geared for kids. When Sadie saw the book she was excited to see the familiar faces of our zoo buddies & she spent an hour looking through every project. I kid you not! An hour! She gasped with excitement & had to point out nearly every project to me. The six year old of the family is very much in love with this book! We decided to first make the Upcycled Apartments. They are cleverly made from empty tissue boxes so there is a prefect little window. The girls had a complete blast making these. They were in crafting heaven & it was really nice to spend such quality time together. Super fun, right?! Okay now on to the giveaway. Wiley, the publisher of this book is offering a signed copy of Teach Yourself VISUALLY Crafting with Kids to one lucky Sparkle Power reader! Would you like to win? All you have to do is leave a comment on this post. Please make sure that you include your e-mail address so that I can easily contact the winner. You have until Wednesday, April 13th to get your entry in. I will announce a winner the following day. This would be such a fun book to win! My girls LOVE crafting, but I don't always have the energy to come up with the ideas. This book would help solve that problem! This reminds me of the dollhouses that my friends and I used to make. We took big boxes and added partitions to make rooms. We made dolls out of cloth using embroidery floss for hair and facial features and then created and sewed clothes for them. I still have my cloth doll, my niece places with it now and her clothes have gotten a lot more sophisticated! I'll play along! I love the look of this book and love Jcasa!!! hooray for giveaways! I really want this book. My daughter will be 4 this month and is really getting into crafting. 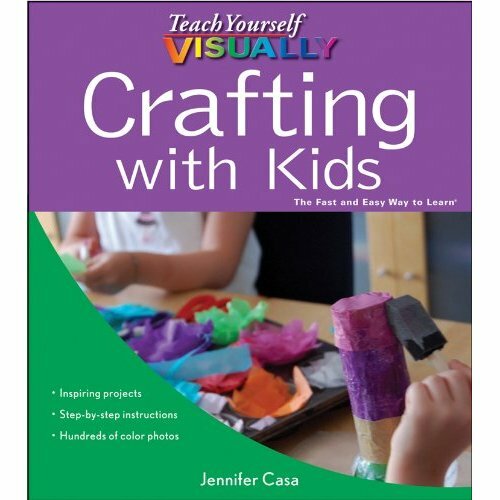 I would love to win a signed copy of Teach Yourself Visually Crafting With Kids! What a great resource for this summer's long days at home. Hi! I'd love to try the ideas of the book with my son. I don't know if the giveaway is international, though. This would be fabulous. My kids love to make things with me, and this would be a great resource when I can't think of something! Thank you! Super fun! Just in time for spring break. Looks like a book I would love to have! always looking for new craft ideas with 4 kids in the house :) Thanks for sharing! Looks like a great book! There are never enough projects to keep the little ones happy. Love Jennifer's blog and would love to win this book! What a great way to discover new blogs. Great apartments! That book looks awesome! How cut eis that apartment? I have exactly the same issue with my kids and the computer. It is a never ending battle, as I don't like them on there often. My daughter will flip for that book - she is always wanting to do crafts, and some days I would rather be inspired by a book than my own brain! And..you have the sweetest looking little girls! I wish we lived close bc Caleb would just love them! I've enjoyed reading Jennifer's blog for a while now and am looking forward to getting a copy of this book for our house. My four-year-old loves anything that is crafty! this book looks so great for my kids. I love crafting with my kids and am always looking for new inspiration. This book would definitely be it! Thanks for the chance to win! What a fun book! I would love to do more projects with my kids! Thanks for the chance to win it! I have been looking forward to this book. I would love some more crafty ideas for my girls and I! What a great book! Thanks! What an awesome book. It might save me the hours I spend on the computer checkig out craft blogs. I also want you to know you are not alone, I dread the "Can I play on the computer?" question - thankfully they don't know how often I'm on the computer when they go to bed! those apartments are amazing! love them! I would love to win. I think my girls would adore making these apartments! That book just might save me this summer when I am needing things for my 5 year old to do! Jennifer is so creative. I would love to win this book. Now we need to use tons of tissues! yesterday i hesitated tossing an empty box...what can i make with this? i wondered before it hit the recycling bin...darn. we so rarely use tissue i shall have to hit up some snifflers for their empties! thanks for the chance...love to see Jennifer's other ideas! the book looks great! My girls love crafts and I'm always looking for inspiration. I'm off to put on my wishlist in case I don't win it. thanks for the chance! This book looks great! I would love a chance to win. That book looks awesome!! I've made it a goal to do more with my little girl and I'm sure this book has some great ideas. This book tour has found a new blog to follow! With a 2 and a half year old granddaughter and (hopefully) more grandkids to come, I could use a refresher on kids crafting. We would put this book to great use! You always have fun giveaways, thanks! I need this book! I have a one year old and can already tell I'm not creative enough to keep him busy all day long! My girls (9 & 6) would love this book as we have lots of fun crafting together! Thank you for such a cool giveaway and for the chance to win! pick me! i teach an art class during the summer at my house for extra money for my daughter and her friends,and this would inspire me for new ideas! thanks for the giveaway! I've followed JCasa's blog for a while. I'd love to get her ideas in a book form! I'm a total newb when it comes to crafting with my kids. This would be a perfect jumpstart! My daughter would die for this book! It looks so fun! This book looks delightful! perfect for a rainy afternoon like today! I'd love to win a copy of this book! I have lots of little hands to keep busy this summer! I'm always looking for more crafty inspiration.. I'd LOVE this! Looks like a great book -- thanks for the chance to win! This book looks great for my crafty kids. Thanks for sharing. I loved this post! It reminded me of when I was in 4th grade and I made a similar home with a kleenex box. I brought it to school and got in trouble by my teacher for playing with it and not paying attention in class. I was obsessed with my creation and to this day I think about it often. I remember the feeling it gave me (creating) and how important that feeling become of who I am today. I would love the opportunity to win your book give away. My youngest boy loves technology way too much and this would be a perfect opportunity to "create" together. Candace, I just discovered your blog and I'm hooked already... I'm new to following blogs anyhow but I saw your "pregnant barbie" post on pinterest while at work today... I am an OB nurse... And I simply HAD to have her! I went right to toysrus on my way home am now the proud owner of my very own pregnant barbie! :) And now I want this book, too! !